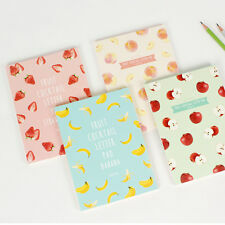 Item : 63sheets Cute Sweet Fruits Cocktail Writing Paper Pad. Size : 147mm x 205mm x 10mm / Quantity : 1ea(63sheets). Wanna See more writing paper set?. Color : Strawberry, Mango, Cherry, Banana (Just color of cover. ). 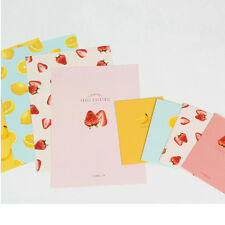 Item : Cute Fruit Writing Paper Letter 1set. (Composition 1set : Writing paper 4sheets & Envelope 2sheets). 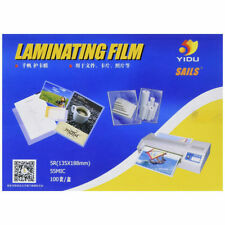 Size : Writing paper 175mm x 250mm, Envelope 130mm x 95mm / Quantity : 1set. Wanna See more writing paper set?. Q-LIA / Little Fairy Tale Flower Mini Letter Set. This is small letter set. Made in Japan. Item : 63sheets Space Writing Paper Pad. Size : 169mm x 247mm x 10mm / Quantity : 1ea(63sheets). 9various designs Total 63sheets. Color : Moon, Aurora, Mix Purple, Blue Star (Just color of cover. send randomly). KAMIO JAPAN / Pizza Party Flake Sticker. The process of manufacture is SIMILAR TO PAPER except that the PULP used is NOT VEGETAL but ANIMAL. It is NOT made out of one single processed animal skin. We believe it belongs to a museum display of historical attempts to sophisticated writing supports. Fishing Cat Star Letter Set. Composition : 8various design x 6sheets = Total 48sheets. Wanna See more writing paper set?. Color : Red, Blue, Beige, White (Just color of cover. send randomly). We will try to reply within 24hours. Q-LIA / Little Fairy Tale Alice in Wonderland Mini Letter Set. This is small letter set. Made in Japan. CRUX / Animal Doughnut Letter Set. Japanese stationery. Made in Japan. This is a beautiful collection of Art Nouveau letterheads. They are standard sized pages 8-1/2" by 11". Perfect new, unused. ISBN #0-8118-2045-9. Color: As the picture show. United Kingdom. Rate (item arrived). If you buy 2, we will give 1 free Disney Series Set(Random design). Colour in the picture might be slightly different due to the lighting when picture is taken. Components : 8 Papers, 4 Envelopes, 4 Stickers. 10 beautiful letter pages, 5 envelopes and cute stickers.This is a super cute letter set and would make a great gift! Simply adorable paper! 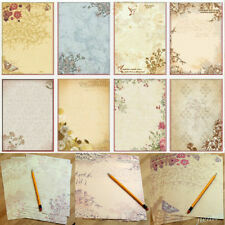 Item : 63sheets Lovely Flowers Writing Paper Pad. 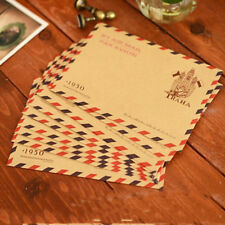 Size : 169mm x 247mm x 10mm / Quantity : 1ea(63sheets). 9various designs Total 63sheets. Wanna See more writing paper set?. Color : A,B,C,D (Just color of cover. ). Lot of 30 sheets of Sanrio notepaper. But they are certainly in "new" condition. Each set includes 30 sheets of Sanrio paper with characters featuring a combination of Hello Kitty, Badtz Maru (penguin), Pochacco (dog), Nyago (cat), Dinomights (dinosaurs), Chococat (cat), and Kuririn (hamster). Item : 42sheets Colorful Vivid Lined Writing Paper Pad. Size : 170mm x 250mm/ Quantity : 1ea(42sheets). 7various color x 6sheets = Total 42sheets. Wanna See more writing paper set?. Color : Red, Green, Yellow, Blue. 3 designs each 30 sheets / Total 90 sheets. KAMIO JAPAN / Yeastken Bread Dog Mini Letter Set. Made in Japan. This is small letter set. Item : 63sheets Hey Animals Writing Paper Pad. Size : 169mm x 247mm x 10mm / Quantity : 1ea(63sheets). 9various designs Total 63sheets. Wanna See more writing paper set?. Color : A.Goose, B.Winter Fox, C.Kitty ,D.Dog (Just color of cover. ). 22 pages Colour Tarot Illustration inside. Size(cm):175mm x 120mm　1cm thick. Condition : NEW. Made in Japan. This is small letter set.